Workplace injuries can be overwhelming to deal with. The stress of trying to document everything, while attending doctor appointments, recuperating and not feeling well all at the same time can prove to be too much for some people. 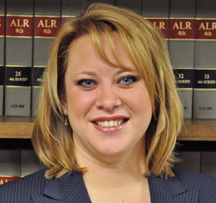 In that regard, it is best to talk to an attorney who can eliminate some of the stress by making sure you are getting all the benefits that you are entitled to, preparing and filing paperwork, and speaking on your behalf to your employer, the employer’s insurance company and the Department of Labor. But, if you do choose to go it alone, there are a few things you should know that will make the process seem less daunting. 1.Know what Workers’ Compensation is – Workers’ Compensation, generally speaking, is a system by which an injured worker may recover for an injury they sustained while on the job. These benefits are meant to put the injured worker back into the same position (health wise) that he was in prior to becoming injured. There are several types of benefits available to the injured worker, which are discussed below. 2.Know the benefits to which you are entitled – Injured workers may be entitled to some, or all of the following benefits: medical bill and prescription payment, lost wage replacement (in the form of total or partial disability), mileage, permanent impairment, scarring and disfigurement, and death benefits. Check in to each of those types of benefits and make a claim for all that apply to your injury and treatment. For the more complicated cases involving wage loss or inability to work due to an injury, a consultation with an attorney, like those in my office, would be prudent so that you know how much income you are entitled to on a weekly or bi-weekly basis. 3.Know how to properly report your injury – Work injuries must be reported to your employer as soon as possible. The longer you go without reporting your injury, the more suspicious it will seem. It is best to give this notice in writing, so as to avoid any confusion later on. Failureto report your injury may deprive you of the benefits to which you would otherwise be entitled. If your employer does not agree that you were injured on the job, or does not agree with the nature and extent of your injuries, you will need to file a petition at the Department of Labor. Again, if your case rises to this level, then it is best to have legal representation on your side to help navigate the process for you. Once your injury claim has been accepted, close monitoring is required to assure that payments are being made in a timely and accurate manner. This includes confirming with your doctors that their bills are paid timely, reviewing the lost wage checks to confirm that they are paid in the correct amounts and on time, and continual submission of mileage claims. For further details on the amounts and types of benefits you may be entitled to, please see my August 2011 article in this magazine, entitled Know Your Rights. The article can also be found online at Thewomensjournal.com, and provides detailed information on how to compute the dollar amounts for each of the above-described benefits. If you believe that you were involved in a workplace injury, report the injury as soon as possible and then seek medical attention. If ongoing medical care, lost wages or scarring has happened as a result of the injury, you should enlist the help of a skilled attorney to make sure that you receive all benefits to which you are entitled. 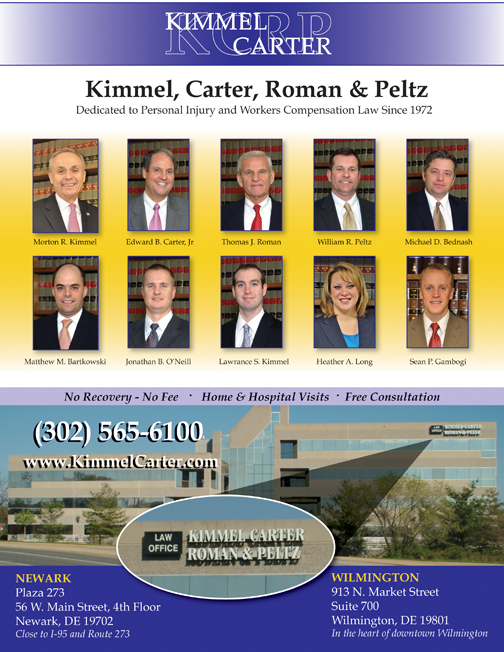 All of the attorneys at Kimmel, Carter, Roman & Peltz are skilled litigators, and can ease the burden of dealing with the insurance company and your employer. The consultations are free, and the advice is invaluable! Our attorneys will fight to get you all the benefits that you deserve.